Victory for Lynn. © FIA. Alex Lynn scored a lights-to-flag victory at Brands Hatch this morning, although it was no easy task for the Englishman. 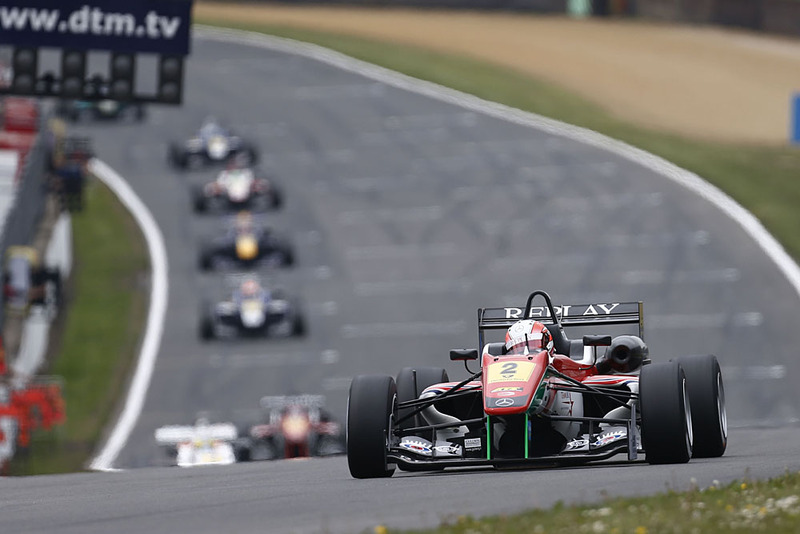 Lucas Auer made it a Prema 1-2-3 as he took his Dallara F312 home to 3rd place. The poleman Lynn kept ahead of front row rival Marciello off the line, dodging the Italian’s advances through Paddock Hill Bend and Graham Hill hairpin, pulling out a narrow lead, before being pulled back by the 2nd placed man. Indeed, the lead was never more than one second throughout the 51-lap event, with Marciello keep tabs on the leader in through the opening 22 tours. The race became somewhat more complicated for Lynn thereafter, when lapped traffic began to come into play. Most of the tail end runners played kindly as the leaders came through, except for T-Sport man Spike Goddard, who from lap 40-42 seemed determined to sit in front of the quick men. With Muller gone, Rosenqvist held 4th to the flag, with Carlin’s Harry Tincknell in a relatively distant 5th. Tincknell led a group over the line, with Tom Blomqvist (6th) not far behind. Jordan King made 7th his own thanks to a lap 35 pass on Josh Hill (8th), with Will Buller (9th) and Daniil Kvyat (10th) rounding out the top ten. As Kvyat is non-points scoring driver, Antonio Giovinazzi picks up the final score with his 11th place finish. It was a tricky day for Fortec’s Felix Serralles. An off on lap four dropped the Puerto Rican from 12th to 15th, before a tangle with Mans Grenhagen on lap 20, pitching Serralles to the edge of the top twenty. Several retirements would see the Fortec rise to 16th, but no further.